Lined stoves and small open fires – from £60 per standard sized flue and opening serving lined stoves and smaller open fires (dog basket open fire prices are shown below). 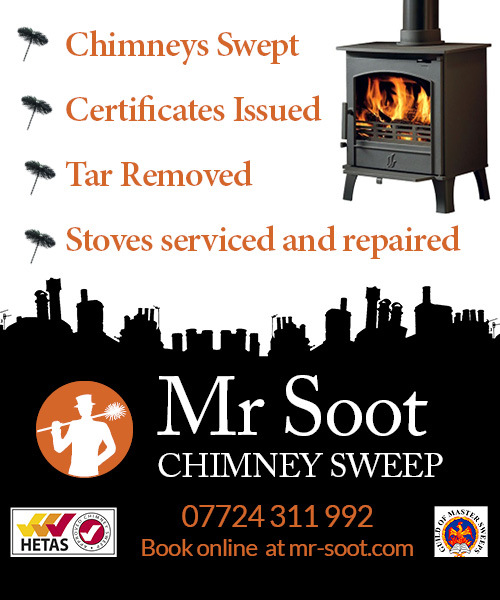 This includes a full sweep carried out to national standards and the issuing of an insurance industry-recognised Certificate of Sweeping from The Guild of Master Chimney Sweeps. Lined multi fuel stoves, woodburners and small lined/unlined open fires all catered for. See T&Cs below for details on gas fires and sweep access. Please note that if, during the sweep, I discover a bird’s nest, then its removal is an extra, chargeable service (see below). Book now. Unlined Stoves – from £75. These are multi fuel stoves and woodburners which are typically installed into masonry/clay flues without a modern solid fuel liner.The reason it is more expensive than a standard sweep is that the gathering the fallen soot is more time-consuming as it has be be taken off the register plate through an access hatch. Please note that if, during the sweep, I discover a bird’s nest, then its removal is an extra, chargeable service (see below). Book now. Standard Sized Gas Fires – £60: Some flues serving gas fires can be swept without moving the appliance. This is usually identifiable by looking up the chimney and being able to see a void. However, if you cannot see a void, or the opening to the flue is narrow (long and thin like a letterbox or just with a couple of round holes) this usually means the appliance needs to be disconnected before gaining access to the flue. This MUST be carried out by a registered gas engineer before I can carry out a sweep. This is to be arranged by the customer and is at the customer’s own expense. Please note I do not carry out servicing of the actual gas fire – that also must be done by a registered gas engineer. Please note that if, during the sweep, I discover a bird’s nest, then its removal is an extra, chargeable service (see below). Book now. Large opening/dog basket open fire (solid fuel or gas) – from £80 These are usually found in large, older properties including stately homes and homes of local, historical interest. Please note that if, during the sweep, I discover a bird’s nest, then its removal is an extra, chargeable service (see below). Book now. Pre-installation/flue closure sweep – £80. This is a sweep which takes place an appliance before a new appliance is fitted. This is to ensure the flue is clear of any remaining soot deposits and, if a liner is being fitted, confirms both a clear passage and helps determines the length of the flue. In the event of a flue being closed off, this service helps reduce the risk of damp in the chimney caused by any residual soot deposits in the flue. Please note that if, during the sweep, I discover a bird’s nest, then its removal is an extra, chargeable service (see below). Book now. We can also supply and fit new stove glass, firebricks and baffle plates. Prices vary depending on the make of stove – please enquire for more details. Service available January-August only. Inglenook Open Fire Sweeping Service – from £80 depending on the size of the opening into the room. Usually this means anything over 6ft in width.Please note that if, during the sweep, I discover a bird’s nest, then its removal is an extra, chargeable service (see below). Please contact Mr Soot on 07724 311992 with your specific requirements or book now. Commercial/Landlord Services – Mr Soot undertakes regular contract work for landlords and licensed premises such as pubs and restaurants. As a HETAS Approved Sweep, we are also able to issue Landlord/Agent Safety Records. Please get in touch to discuss your specific requirements. Enquire now. Bird’s Nest Removal – From £150-£250. All nest removals include a CCTV inspection to confirm that the flue is clear of debris. Please note that, in accordance with the Wildlife & Countryside Act, it is an offence to destroy a live nest. As such, our policy is not to remove nests which are suspected of capable of being live between the months of February and August inclusive. Book now. Tar and Creosote Removal – From £250. This is a chemical treatment applied to a flue which has large deposits of tar or creosote. Removal of these deposits is essential as using the flue while in this state can cause a chimney fire. Tar and creosote must also be removed before fitting a liner. Book now. Carbon Monoxide Alarm supplied and fitted – £40 each, or £25 if I am already at your property carrying out another service. Book now. Inspection Fee – £40: In the event of being unable to sweep an appliance due to access issues, inappropriate installation or other hazards present, I reserve the right to charge a standard £40 Inspection Fee. This will include bespoke advice on the nature of the fault(s), suggested remedial actions and, where relevant, completion of appropriate documentation. 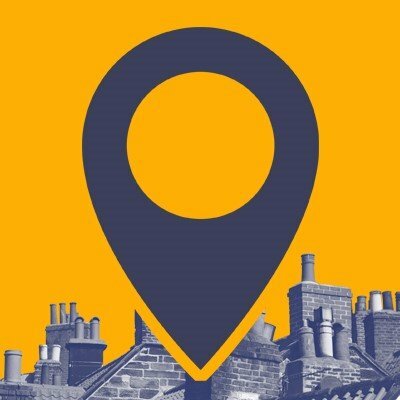 Missed Appointment Fee – £40: A call out fee of £40 will be applied if, upon arriving at an appointment, I am unable to gain access to a property for any reason. To reschedule or cancel appointments, please call 07724311992 by noon the day beforehand. Preparation for the sweeping appointment: Appliances must not be used at all in the 24 hours leading up to an appointment. Please remove any ash/debris/other items from the fire grate so it is clear. I require a space of around 6ft in front of the fireplace, so please move any coffee tables/furniture and items from the hearth.